Many many thanks to StrawberriesBlueberries for compiling that load of videos in the "live updates" thread! Additionally a big hand to all the tapers of course! Edited 2 time(s). Last edit at 2014-03-04 11:32 by maradona. MAN!! That top photo in this thread is AWSOME!! So Rock and Roll. Look at Ronnie being RonnieFknWood!! Edited 2 time(s). Last edit at 2014-03-01 16:40 by Max'sKansasCity. Edited 1 time(s). Last edit at 2014-03-01 19:27 by StrawberriesBlueberries. Not a very good version, the backup vocals are extremely disturbing (especially in the beginning of the song) and it sounds like Mick is singing slightly out of tune all the time. Great version! Nice that Ronnie is playing the same lick that is on the studio version during the intro! Never heard him play that before. maradona, there's an audio-only YouTube clip of Slipping away in the other Tokyo thread, thanks to Toru A. Thought, I post Toru A's video from the other thread here. Thanks very much, Toru! Thanks a lot to everyone! Updated with the latest clips. We thank YOU! Vielen Dank mein Freund Dieguito! 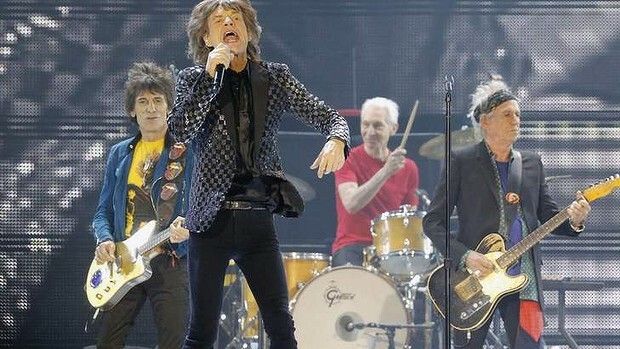 Mick is just amazing, looks like a young man running across the stage in that Brown Sugar clip. It's no real video, because you can't see anything apart from a still picture, but it's an audio recording of the whole concert. I know, it has been posted elsewhere before, but thought it would be nice to have it in this collecting thread, too. I'm listening to it right now and am enjoying it very much! So, finished it now after some breaks, because I had to eat sth. and do other things. Made me feel like being there a bit. Wow, what a great energy between band and crowd!!! It sounds like they all were really on Fire. I didn't notice anything that really harmed the overall good impression of their performance. This show was very good regarding the actual presentation of a not very inventive/surprising selection of songs.